In 1810, the first settlers in this area settled on the flats below the bluff where Fort Meigs would be built a few years later. When the War of 1812 began, these early settlers fled for safer quarters. After the war when they returned, they found their homes had been burned. But the settlers were determined to rebuild the town they had nicknamed Orleans of the North, thinking that it would become a port that rivaled New Orleans. However, the location was poorly chosen and the forces of Mother Nature destroyed much of what they tried to rebuild. It would take several years and moving the original settlement up the the top of the bluff that overlooked the Maumee River before the village would become firmly established. In 1816, the village was officially named Perrysburg in honor of Commodore Oliver H. Perry, who out maneuvered the British naval forces and ultimately defeated them on the waters of western Lake Erie in what would later be called The Battle of Lake Erie. Remembering their hopes from the original settlement along the river's edge, they named their main street Louisiana Avenue. Located just south of Toledo on the east side of the Maumee River, visitors to Perrysburg you can leisurely stroll the historical downtown business district and find unique shops and eateries, most of which are in older Victorian buildings in an unhurried small-town atmosphere. The Town Center at Levis Commons offers a mix of distinctive stores, entertainment, and restaurants. Not far from the historical downtown area is Fort Meigs, a fully restored fort which played a vital role in America's defense during the War of 1812. Today, Perrysburg has a population of about 18,000 people with upscale living spaces that are also combined with the heritage associated with American architectural styles of the early 1800s. Many of the historic buildings in Perrsyburg are being saved for future generations to appreciate the quality and craftsmanship that is difficult to find today. Hood Park is located at the end of Louisiana Avenue the small park that overlooks the marina and Maumee River. Originally it was called Corn Cob Hill because at one time corn was shelled there before being lowered by hopper to a grain elevator on the river. Hood Park has 2 sculptures: Commodore Perry's which is the most visible and widely known, but behind it and a little further back closer to the bluff, there is a statue honoring those citizens who served in the Civil War. 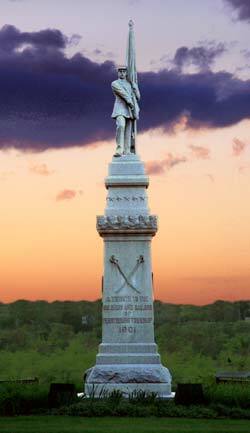 A number of years after the Civil War, the citizens of Perrysburg decided they should erect a statue honoring those men and women who served their country during the great conflict. But it took a number of years to raise the necessary funds to design, craft and erect the statue. As the citizens were looking for a place to finally erect their sculpture. It was John Hood, a Scottish born farmer who owned the land, made a private donation to the village. Because of his wish to remain anonymous, the park was called Monument Park. Years later, the park was then renamed Hood Park in honor of John Hoods contribution not only for the land, but for other charitable contributions he made to the village throughout his life. The statue dedicated in 1902 with much fanfare and honors all those who served their country, not just the Civil War. The Perry statue was added a number of years later. 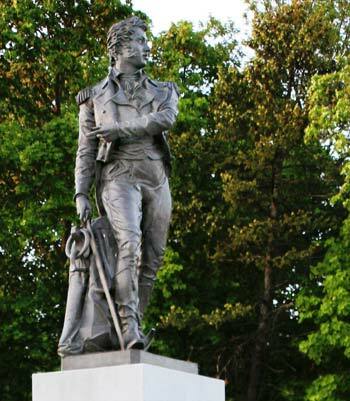 On the village green called Hood Park, is the statue of Commodore Perry which was created by William Walcutt in 1860. For a number of years the marble statue was displayed in Cleveland's Public Square. In 1929, Cleveland graciously donated it to Perrysburg where it was placed in the park. Towards the end of the 20th Century, it was noted that the marble statue had begun to deteriorate due to being exposed to northwest Ohio's harsh climate. At that time a cast was made of the statue and a bronze replica was made to replace the aging sculpture where it stands today. The original marble statue of Commodore Perry was loaned to the National Parks Service Visitor's Center on Put-in-Bay where the Perry's Victory Monument was built in 1915. The original 2 marble cabin boys depicted on both sides of the statue are now displayed in the atrium between the Perrysburg Police Station and the Perrysburg Municipal Building.